I was sent a copy of the guitar software Progression to evaluate a couple of weeks ago. This software is made by Notion Music and hopes to gain the acceptance of guitar composer hopefuls. I used the software over a period of a few days in order to familiarize myself with the product and learn it’s intricacies. The cost of this software is around $100.00 U.S. (list $149.00 U.S.). Progression does not attempt to be a full blown composition program like Finale, Sibelius or its’ sister product, Notion 2.0. This software is more of a singer/player/songwriter type of composition software. It focuses primarily on rhythm and lyrics, however you can add plenty of staves to accompany whatever types of instruments you might like to include in your budding composition. Where this software shines is it’s built in sample library. The sound library is truly sonically impressive. 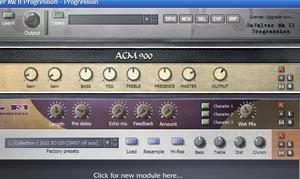 It includes samples from Neil Zaza, Victor Wooten and Roy Wooten as well as piano, clavient and Fender Rhodes (as I said, the software focuses mainly on guitar and popular combo music). For other types of sounds you have access to the standard MIDI compliment. I did not see the option to pull in other external sample collections that you might already own (of course :(, you can buy some sound expansion kits at their site…). The software offers a number of ways to input music into the score including real-time midi, step insertion midi and the standard drag/drop/note_audition methods. The one thing I found missing was the ability for Progressionto quantize the MIDI input. This could pose some problems for many people. That being said, it is relatively easy to place your notation on the staves. The note/entry palette is always visible and includes the basic arsenal of note entry options. There are only two voicing options for input (i.e. you could have a quarter note on the staff and add a pair of eighth notes on top of it in the same beat -but not a third note element like a triplet on the same beat) but that should be enough for the target audience of this software. I did not read if it had a staff number limitation, but I was able to get 12 staves added with no problem, which would again, be more than enough for the target audience of this software. The VST effects library is particularly well tuned in this application. Each staff (or channel) can have 3 separate FX libraries (each with multiple VST effect racks). You may choose from the integrated FX libraries or amp simulators or add your own. Writing tablature and chord tabs is particularly easy with this program (as you would expect it to be as a touted guitar product). In addition, the software supports custom guitar tunings and a small library of percussive patterns for inclusion into your compositions. The program never was able to import standard MIDI files for me, it crashed every time I tried (on two computers). In addition, when you import, Progression automatically looks for “score” files and not MIDI files. The program did not work at all on VISTA and I could not find an update on their site to address the issue. Finally, I would like to see the drum notation convertible from standard MIDI piano notes to standard readable drum notation. Incredible native sound sample library (limited though). N-Tempo Tap feature (set your own tempo by tapping) is pretty cool and useful. The Velocity overdub feature is pretty nice for changing dynamic inflections and easy to use. The mixing features for each staff (channel) are nice and easy to use. This software fills a niche and does so nicely. If you are looking for this type of software for under $100.00 U.S. then this just may be your ticket. Currently there is not a demo version of this product but you can check out some pretty nice scores and awesome sounding audio tracks that were created with it here.